Don’t let a bad boss ruin your career by denying your need for accomplishment. Born creatures of progress we all need the chance to learn, grow and evolve or we risk becoming bored, restless, frustrated and ultimately unproductive. Luckily doing something about your bad boss is entirely in your hands! Carol Dweck, an extraordinary Stanford psychologist, has found changing the way we perceive ourselves – regardless of what our bad boss thinks – can dramatically improve our feelings and results. In particular, two beliefs in particular can make a difference. People with a “fixed mindset” believe they’re born with all the natural abilities they’ll ever have and there is little that can be done to improve upon this. As a result, they tend to create performance goals – like being a successful businessman – because they believe that potential is measured by the validation received from others, including their bad boss. When we believe that our abilities are basically static because they reflect the way that we’re born, then not surprisingly, we’re more likely to avoid challenges, be unwilling to be seen to be exerting too much effort and feel threatened by negative feedback from our bad boss, because we fear others will see any failures as an indication of all we lack. Unfortunately, both success and failure cause anxiety for people with this mindset. Failure, in particular, induces a state of helplessness when it comes to dealing with their bad boss, which means they don’t pay attention to learning information, disengage from the problem and become depressed, de-energized and lose self-esteem when they inevitably give up. On the other hand, people with a “growth mindset” believe they’re born with the capacity to improve their abilities through learning and effort – even if they’re working for a bad boss. As a result, they tend to create learning goals around mastery and competence. When we believe our abilities are like muscles that can be built up with practice, we are more willing to see our bad boss as a challenge, to put in our best effort and to accept criticism, because we understand that learning is the only way to keep getting better and either overcoming our bad boss or getting ourselves to a position where we can find a much nicer one! Creating goals for learning – even if it’s how to overcome a bad boss – has been shown to increase our performance and enjoyment and decrease negative emotions. Failure and setbacks induce a response of mastery for people with a growth mindset that pushes them to focus on what they’re learning, rather than how they feel, and galvanizes them to find new ways of dealing with their bad boss. They are also then able to think “outside of the box” to solve their bad boss problems because they believe they can. More important than believing in your own abilities is the mindset that you can improve these abilities. By tuning into the stories that you tell yourself and reframing the setbacks of a bad boss as learning opportunities, rather than failures that damning you to misery, you can move your mindsets from “fixed” to “growth”. Rekindling your hopes – When you’re able to be clear about what you’re hoping for (your goals), your ability to make it happen (your motivations) and the steps you should take (your pathways) then you’re more likely to accomplish what you long for, even in the face of setbacks and challenges. 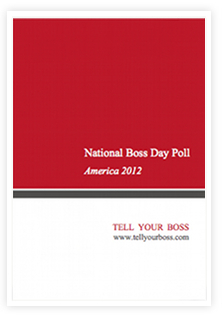 When it comes to your bad boss is there a win-win outcome of mutual growth worth hoping for? Managing your weaknesses – It’s common for bosses to want their employees to overcome weaknesses, but it can be a futile ordeal, both professionally and personally. In contrast, building your strengths, is more engaging, enjoyable and rewarding because achievements accrue far quicker. Can you use your strengths – what you do well and enjoy – to manage your weaknesses, make progress and get your bad boss of your back? Playing at work – Workers who play are viewed as emotionally involved in their jobs are more likely to be evaluated well by their bosses (even bad bosses), as well as their co-workers. By breaking your goals into small missions, setting a limited time frame, leveraging your strengths to overcome the obstacles and developing a meaningful way of keeping score, you’re able to turn something overwhelming or tedious into something surprisingly motivating by making it fun and playful? 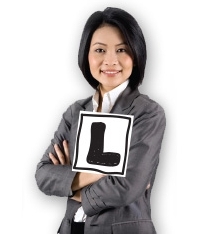 Turning failure into success – Re-frame your bad boss “failures” into learning opportunities improve your sense of progress so that you can open yourself up to even greater accomplishments. Every criticism your bad boss makes is a learning opportunity in the making. Don’t just focus on the outcome, think about what you can take from the journey. Need more bad boss ideas? Take action now and to reward you – for this week only – we’ll give you a free gift valued at almost $200 to celebrate your courage. This week as part of the National Boss Day celebrations I’m giving away nearly $200 worth of freebies for anyone who buys my book “5 Reasons To Tell Your Boss To Go F**k Themselves: How Positive Psychology Can Help You Get What You Want”. 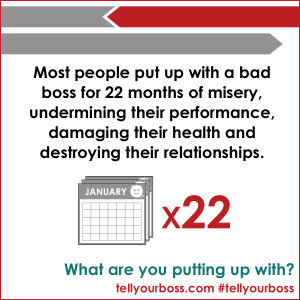 Don’t wait the 22 months it takes most of us to free ourselves of a bad boss. You can do something about this right now! Build courage and confidence so you can disarm even the most difficult boss. PLUS to thank you for your purchase you’ll also receive a FREE registration, worth $195, for my newest online training program “Becoming An Organizational Superstar: How To Put Your Strengths To Work”. That’s right it won’t cost you a cent! Find out more here. I thought your idea of focusing on one’s strengths and managing your weaknesses was great. You shouldn’t ignore your weaker areas but you may also never be the strongest in it. Plus focusing on negativity can often bring a person down even more. I like the Turning failure into success – When bosses learn to take criticism, and turn that into a learning experience – that means they’re human too, and make mistakes also! However when they react to turn it around and make it to a learning experience makes them a great boss!